Professor Anderson teaches costume design, construction and history and is co-author, with her husband Cletus, of the textbook "Costume Design," second edition published by Harcourt Brace in 1998. 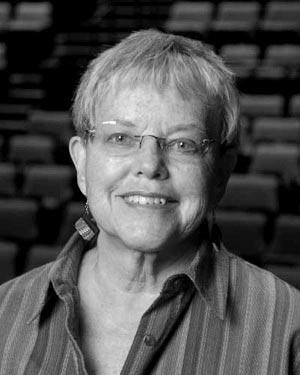 She has designed and supervised costumes for productions at the Pittsburgh Public Theater, the Pittsburgh Civic Light Opera, CLO’s Gallery of Heroes original musicals, the National Repertory Theatre, Yale School of Drama, McCarter Theatre, the Dartmouth Professional Theatre, Theatre-By-The-Sea and the Carnegie Mellon Theatre Company. During this past year she designed 3 productions for the CLO Cabaret Theatre and will be doing the costumes for a 1 hour television pilot summer 2009. Spring of 2009 she taught at the CMU campus in Doha, Qatar and shortly after returning from that spent a week in Istanbul soaking up the ancient culture of the city. Her credits in film and television are also extensive. In feature films she was the costume designer for George Romero's Creepshow, Day Of The Dead, Monkeyshines, Two Evil Eyes, the remake of Night Of The Living Dead, The Dark Half and associate designer on Knightriders. Her PBS costume design work included the American Playhouse film: The Silence At Bethany, the Emmy Award-winning Leatherstocking Tales, the 12-part Decades of Decision, the 5-part John Marshall series for the U.S. Supreme Court, the National Geographic Shakespeare series, productions for the Wonderworks and Once Upon a Classic series. She did specialty costumes for Mister Rogers' Neighborhood, particularly his original operas. She also designed the costumes for the historical films Struggle To Survive and Dream of Empire for the city of St. Augustine, Florida. For a change of pace she has done industrials and company mascots. Recently, she created historical costumes for the John Heinz Regional Historic Center, ranging from an Indian chief of the 18th century to steel workers in the 1980's. Individual costumes created for the Heinz Center included such notables as Andrew Carnegie, H.J. Heinz and George Washington. She has participated in many panel discussions and portfolio reviews at USITT conventions where she and her husband were invited to present a retrospective of their work in 1997. She has also been on the accrediting team for the Hong Kong Academy School of Theatre Arts. Professor Anderson has received the Ryan Award for excellence in teaching in the University and the Hornbostel Award for excellence in teaching in the College of Fine arts. Professor Anderson received her BFA degree from Drake University and her MFA from the Yale School of Drama.